Palo Santo ("holy wood") is a wild tree native from Mexico and the Yucatán Peninsula to Peru and Venezuela. 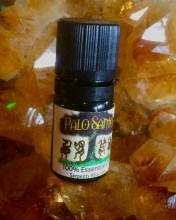 Palo Santo Oil is concentrated, and found only in the interior of the tree's trunk. 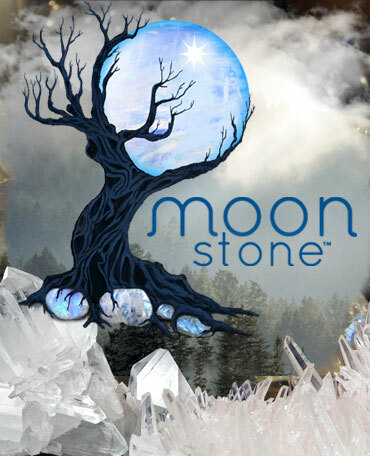 It can take up to 10 years to produce the oil. The average life of the tree of Palo Santo is between 80 and 90 years, but because of over-harvesting, only tree branches that have fallen naturally to the ground are used for the distillation of our oils. Our Palo Santo sticks are also harvested in this way. Palo Santo oil was used during the time of the Incas for its reputed spiritual purifying properties. Today, palo santo is used by healing practitioners by applying diluted essential oils to the base of the skull or on the spine to increase relaxation. Palo santo sticks may be burned, similar to incense, and used for ritual smudging. In Peru, a shaman, or medicine man will light palo santo sticks and the rising smoke will enter the energy field of ritual participants to clear misfortune, negative thought-prints, and evil spirits. 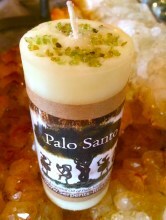 Pure powdered Palo Santo in corked glass jar.